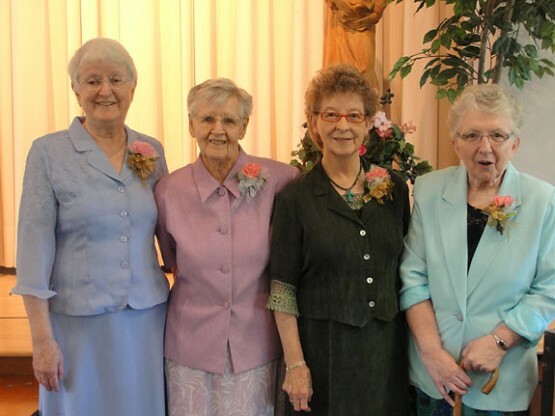 Sisters Esther Anderson, Elizabeth Scully, Teresa Frawley and Bridget McNamara are jubilarians for the Sisters of St. Francis of Philadelphia. The Sisters of St. Francis of Philadelphia celebrated their annual jubilee weekend this summer for sisters who were celebrating 50, 70 and 75 years of religious profession. More than 200 sisters and lay associates gathered in Our Lady of Angels Chapel in Aston, Pa. for a Mass. The 27 Franciscan women represent 1,478 years of service throughout the U.S. as well as in other countries. Four of this year’s jubilarians have ministered in the Archdiocese of Portland. Sister Elizabeth Frances Scully is celebrating 70 years of religious profession. Her years of ministry in the archdiocese include teaching at North Catholic High School in Portland and St. James School in McMinnville. She also worked as a legislative staff person at the Oregon Center for Peace and Justice. Sister Elizabeth currently volunteers at the Franciscan Spiritual Center in Aston and does spiritual direction for some of the retired sisters at Assisi House, the congregation’s retirement residence in Aston. Three of this year’s golden jubilarians, each celebrating 50 years of religious profession, ministered in western Oregon. Sister Esther Anderson served first as a provincial council member and later as provincial of the former Sacred Heart Province of the Sisters of St. Francis of Philadelphia which was centered in Portland. Currently she lives in Aston and works as a consultant for various organizations and congregations. Sister Teresa Frawley worked in Portland from 1981 to 1987 and served as vocation director for the sisters. Currently Sister Teresa works in parish ministry at St. Joseph Parish in Ethete, Wyo. The parish is part of the Wind River Reservation where Sister Teresa has ministered since 1982. Sister Bridget McNamara taught at La Salle Prep in Milwaukie. Currently Sister Bridget lives in Allentown, Pa., and is doing spiritual direction.